Dusty Miller fills a pot. Botanically speaking, its Senecio Cineraria. Native to southern Europe (but with less attitude), it is a perennial to zone 9, but an annual up in these parts. When it is grown as a perennial it flowers in a lovely, little yellow way its second year. But I will have to take the southern gardening books word on that one. 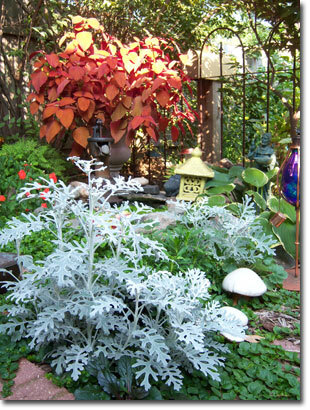 Dusty Miller is a nice brightening, focal point in the shade garden. I think it works so well in the landscape pallet because it has the brightening, highlighting aspects of a white plant, but toned down enough to not over-pop. I used it in a pot in my sunny perennial border when celosia I had planted petered out. I loved how it filled in and added a nice texture. Over in the shade, pond area, it acts as a lovely focal point; an unexpected spray of featheriness. And it is great in my planters that flank my French doors (one side gets sun, the other-not so much). It gets just a little leggy when it doesn’t get a lot of sun. But just a bit. 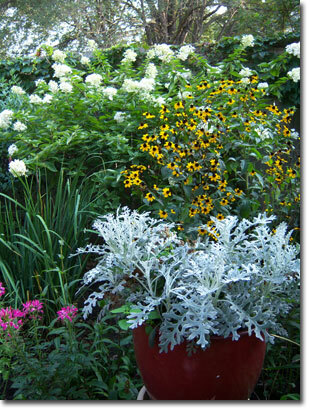 Dusty Miller works well in a shage container. 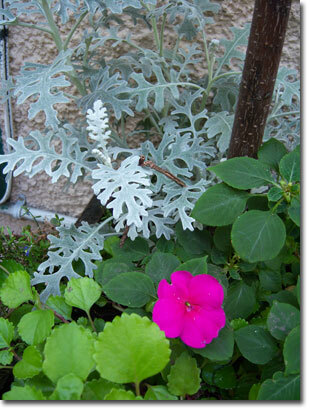 Dusty Miller works great in arrangements and guess what, it is reported to be deer-proof. You can root cuttings of it and it dries nicely, so try bringing in cuttings of it for a fall arrangement. When dried, it actually looks exactly as it does when it is alive and growing. Dusty Miller, you have elevated above the other hoop house spikes and vinca vines. You are a star. Eric; I never planted Dusty Miller until this year for the reasons you suggest–ug, booooring. But I planted one in my front bed this year and like the way it contrasts with other plants without clashing. I’ll plant more next year. Thanks for the extra information on it. my dusty miller is starting to flower, and i live in Ohio….so it must be true! I have a bed of 8 or 10 Dusty Miller under a statue of a women sitting on a sea cliff. Dusty Miller evokes splashing waters and the color is nearly sea foam. My bed is 4 years old, and each year I have to replace only 1 or 2. I do nothing to winter them over (just don’t pull them out). On the second year you’ll notice how dense and interesting they become.